It’s official. The historic Piece Hall is to re-open its gates to the public on Yorkshire Day - more than three years after it closed for a multi-million pound transformation. At 10am on August 1, the bell above the historic Grade I-listed building’s west gate will ring out to echo the first day of trading at the former Cloth Hall on January 1, 1779. It will be a momentous day in the history of The Piece Hall, marking the transition of the management of the building from the council to the Piece Hall Trust and celebrating the restoration of one of Calderdale’s most spectacular landmarks. Council leader Tim Swift said it would become “the place to be”. 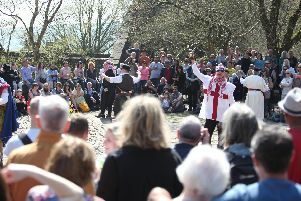 “There can’t be a more fitting date for the re-opening of The Piece Hall than Yorkshire Day, when we celebrate all that is great about our county,” he said. Independent businesses from the food and drink, retail and leisure sectors, keen to be a part of the building’s renaissance are being encouraged to step forward to join an “exciting” list of tenants already signed up. The Piece Hall transformation project has been funded jointly by Calderdale Council, the Heritage Lottery Fund, as well as support from the Garfield Weston Foundation and the Wolfson Foundation.